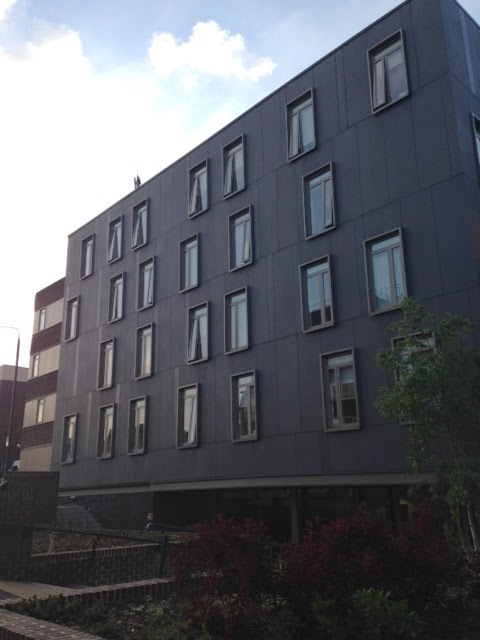 Hello from Nottingham! I'm here on a three-month research and writing fellowship at the University here, and am having a super productive time, though my cooking experiences have been generally lackluster in my pretty basic kitchen of just 2 pots, 1 pan, 1 glass, 1 plate, 1 fork, 1 knife, and 2 spoons. 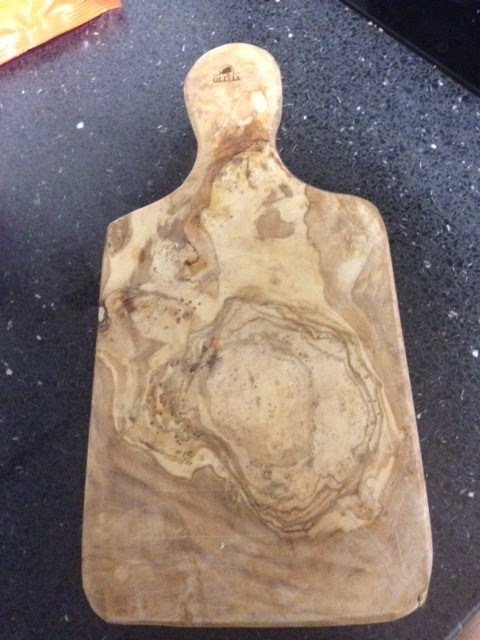 I have supplemented a bit with a nice big mug (debated a long time in the "Poundland"-like a dollar store-whether to buy the one that said "Relax" or "Chill" on it before picking the latter), a proper paring knife, and my favorite find - a beautiful little olive wood cutting board. Yes, these little odds and ends will come home with me! In the meantime, there's been some really great restaurants and many types of ethnic cuisines to try out here, so don't worry - I'm not going hungry! I'm leaving for a week in France and Germany on Tuesday, and so haven't been grocery shopping recently, but this evening, while working on an essay, I pulled together a remarkable little salad with the odds and ends I still had in to bring for lunch tomorrow. I was going for a hard boiled egg, but accidentally dropped the egg a bit when I went to put it in the pan and it cracked. 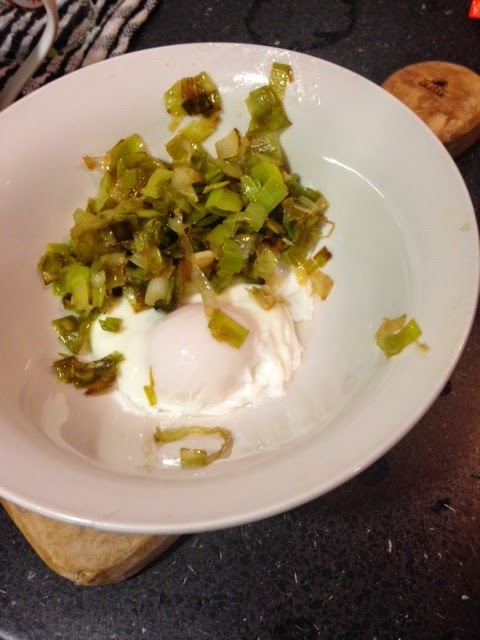 So I went with poached instead! 1. 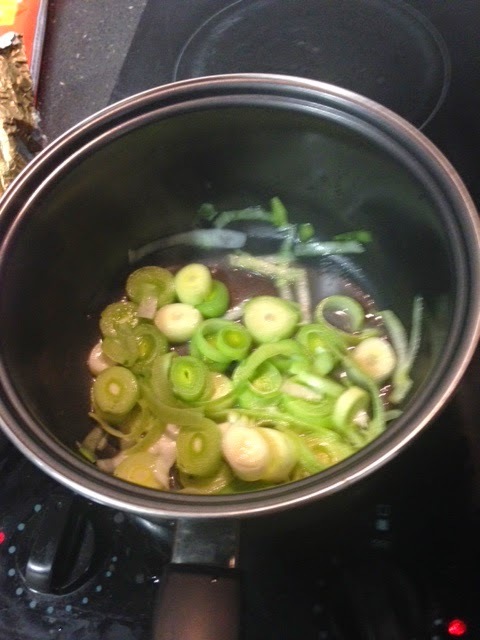 Melt butter in a saucepan or frying pan, and add leek bits. Stir frequently, but these will take about 20 minutes to caramelize over medium heat. 2. Mix lentils and 1 cup of water water in a saucepan. Cover and heat to a boil, then uncover and simmer for 20 minutes, or until the water evaporates. Add 1/2 tsp salt and stir. 3. Bring 2 cups of water to just beneath a boil in a saucepan. Crack the egg and drop the whites and yolk together gently into the water. Take off the heat and cover for 4 minutes. Voila! 4. 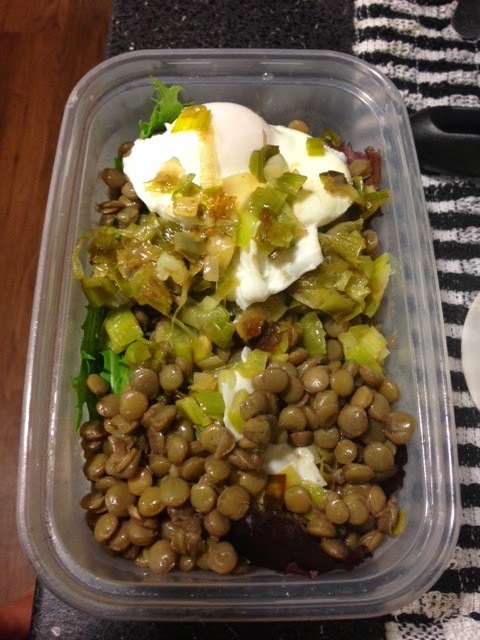 Place leeks, lentils, and egg over a bed of greens, top with a bit of olive oil and sumac (if you happen to have it around). Bon Ap!